With a nine-game lead, a potent offense, one of the best pitchers in baseball, a stout rotation following him (Tanner and Ross’ struggles notwithstanding) it’s a fun summer to be a Nationals fan. As we laugh at every Mets goof, gaffe, and idiotic mistake after idiotic mistake, we are ignoring the looming specter of the real challenger in the NL East: The Atlanta Braves. Get ready for that annoying chop played 64 times an inning. The Freeze is cool now, pun intended, but get ready to hate him too. The Braves have many of their pieces in place already, and have more coming…a lot more. 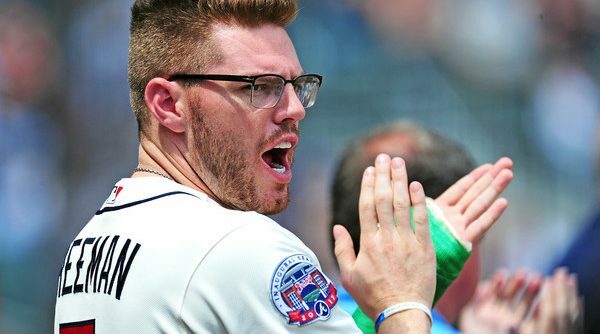 Let’s start with what they have: a fairly solid lineup, led by notorious Nat-killer Freddie Freeman before he went on the DL with a broken left wrist. Freeman has an outstanding career line of .290./.376/.495. The guy is a great hitter with a gorgeous swing that I actually like to watch. Against the Nationals though, he ratchets it up a notch, posting a Hall-of-Fame-level .330/.399/.520 career line. If he wasn’t such a classy, low-key player, I’d hate him a lot more than I already do. It is not just Freeman in this lineup anymore. The Braves made a shrewd move, picking up Matt Kemp last year after he wore out his welcome with the Dodgers. All he has done is return to MVP form—hitting a robust .320/.361/.547. The biggest difference between this lineup and the 2014 lineup the Nats beat into submission to force Atlanta’s rebuild is strikeouts. Dansby Swanson is the only regular with a K-rate over 20%–21.2%. Like Mike Rizzo did to AJ Preller and Erik Neander, Braves General Manager John Coppolella took advantage of a foolish GM trying to build a team in a year by acquiring Swanson for and Ender Inciarte. Inciarte is a fantastic center fielder, who gets on base well and makes good contact. Swanson is a former #1 overall pick, and, according to reports and projections, he won’t be flashy, but he does everything well. Defensive wizard Andrelton Simmonds was shipped to Anaheim for a package headlined by Gio Gonzalez clone Sean Newcomb. Newcomb has posted a 1.48 ERA in his first four starts. His biggest weakness, like Gio, is control. In 24.1 IP, he has a very good 2.96 BB/9, to go with a solid 7.77 K/9. The Braves have done a very good job putting together a team while still rebuilding the farm system. They’ve not only completed the shrewd trades mentioned above, but they’ve done well drafting and done well in the International market—landing prized prospect Kevin Maitian from Venezuela last year. Maitian has drawn early comparisons to Chipper Jones. They have eight of Baseball America’s Top-100 prospects and are far and away the best minor league system in baseball. Their top prospect is Ozzie Albies, currently ranked 8th by BA, just ahead of Nats uber-prospect Victor Robles. Ironically, both signed for relative peanuts–$350,000 and $225,000 respectively. Albies is 20 and is acquitting himself well against much tougher and older competition, hitting .271/.321/.433, with 18 steals. The biggest issue with the Braves right now is their pitching. They punted on an actual rotation this year, acquiring retreads like R.A. Dickey, Bartolo Colon, and Jaime Garcia to go with Julio Tehran and Mike Foltynewicz. While Tehran never lived up to his potential, Foltynewicz has the arm and the youth at 25 to make the necessary adjustments. However, the strength of the Braves farm system is in their pitching. Six of their preseason top 10 prospects are pitchers, and three of those are hard-throwing lefties. That’s in addition to Newcomb. The highest rated is lefty Kolby Allard (28th on BA’s list), a 19-year old at AA with a 2.93 ERA. Following Allard is Mike Soroka, another 19-year-old at AA, boasting a 2.18 ERA. Ian Anderson (60) is 19 at High-A and touches 98 MPH. Lucas Sims is a lefty that touches 97 MPH. They also spent their top pick on Kyle Wright out of Vanderbilt—who was considered for the top pick overall before the Twins took Royce Lewis. Though they boast a great farm system, nothing is guaranteed when it comes to prospects. Three of the top prospects from just last year are struggling: Lucas Giolito, J.P. Crawford, and Byron Buxton. 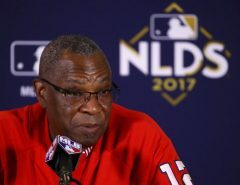 Though not as highly rated, the Nationals have some rising prospects in addition to Robles of their own: Carter Keiboom, Erick Fedde, Juan Soto, and Daniel Johnson. Jesus Luzardo just made his minor league debut and touched 98. They also picked up two top international prospects in Luis Garcia and Yasel Antuna. Not to mention that they spent almost their entire 2017 on pitching. Rizzo and the Nats do well in drafting and developing players—especially pitchers. 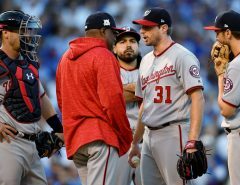 The Braves will continue to be a streaky, middling 75-win type, pesky team, but they are not catching the Nationals, so their fans will remain in hiding for at least another year or two. Although it is an impressive collection, their top talent is still a year or two away from really contributing—especially their pitching prospects. However, if everything goes well for them, they will be a real force in the very near future. I have been a Nationals since September 29, 2004 — the day Washington, D.C. was awarded the team. I live and die by this team, and am an avidly passionate fan! 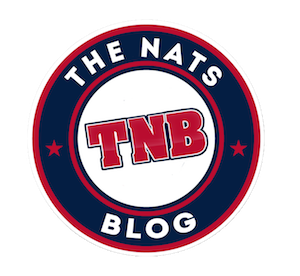 I have a wife and daughter, both big Nats fans — my wife started rooting for the Nats simply because I was in a better mood when they won. I currently work for a government contractor, in business development. Give me a follow on Twitter @onebrightblue1!